Monoject™ needles with K-3 Lancet point used for vaccinating animals. Best for (IM), (SQ) or (IV). Packages of 10. Keep needle cover on the needle end. Put Luerlock end of needle onto syringe. Turn needle to lock into place. Make sure to keep needle covered until ready to use. For livestock use only. Using OB gloves reduces the risk of septicemia during assisted births. Sleeve covers arm to the shoulder. Easy gripping is essential during vaccinations. Uses Luer Lock needle hubs. 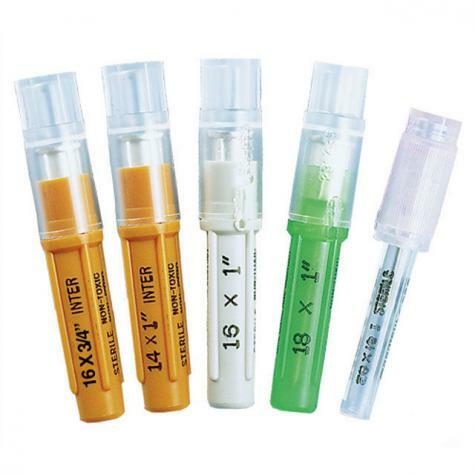 Disposable syringes that are useful for administering one-off vaccinations or treatments to livestock. Recommended: 1 out of 3 said they would recommend this product to a friend. Hard to twist open. Really miss the lure-lock combo—but crazy price hike. Love that they still have the aluminum hub! I get the 1" and find them perfect for both subcutaneous and intramuscular injections. Great value for your money.